HONG KONG — Chinese passenger car sales expanded at a faster pace last month as growth in the world's biggest auto market picked up steam, an industry group said Friday. Monthly figures from the China Association of Automobile Manufacturers show that passenger cars sales in April rose 11 percent over a year earlier to 1.9 million vehicles, outpacing a 3.5 percent growth rate in March. Sales of "new-energy vehicles" such as electric cars and gasoline-electric hybrids more than doubled to 82,000. China's communist leaders view electric vehicles as key to transforming China into a technological superpower. Global automakers including General Motors, Nissan and Volkswagen unveiled dozens of electric and hybrid vehicles at the Beijing auto show last month. Recent moves by Beijing to loosen up restrictions on foreign ownership in the auto industry gave priority to the electric vehicle industry. Under the new rules, requirements for foreign car brands to team up with local state-owned partners will be scrapped by 2022, while limits on foreign ownership of electric vehicle producers will be eliminated this year. The relaxed regulations came amid rising trade tensions between the U.S. and China that might dent U.S. auto imports — Ford vehicles are facing longer waits as Chinese customs agents tighten up inspections. The company said its China sales fell 26 percent in April to 69,503 vehicles. China's total vehicle sales including trucks and buses rose 11.5 percent to 2.3 million. The latest numbers are an improvement on uneven sales earlier this year and a lackluster performance last year as sales growth cooled following a surge in 2016 that was driven by tax cuts. 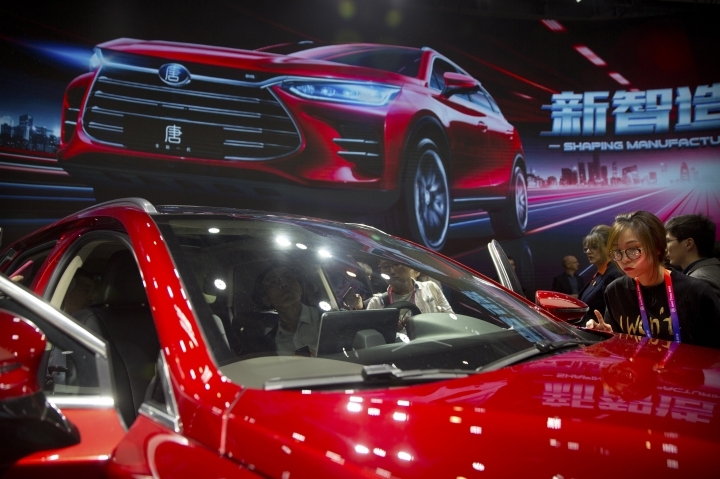 Automakers forecast total market growth for China this year of 3 to 4 percent, a fraction of earlier double-digit rates.